This is a collection of real-time thoughts from Round 1 of the Draft. 95% of what's to come are my immediate insights and interpretations as the pundits spoke and the picks were made (with some random observations mixed in). The other 5% are stats and links I went back in to update. So read below and it'll be like you were right there with me watching last night! 1. I don't understand the process of who gets invited to the Draft and who doesn't. Do agents negotiate this? Does the NFL ask players to attend? If someone turns them down do they ask someone else? When are they asked? Why do I care so much about this? 2. The Berman-Gruden-Kiper trio might have the worst collection of hair-do's in television history. 3. OMG I love Russell Wilson! He just made this opening montage with 50 Cent worth watching. By the way...50 Cent is alive? 4. Wow is this Goodell-Simms-Namath thing embarrassing! Did they even practice what they were going to say? It feels forced, awkward and unnecessary. 5. Congrats to Eric Fisher. Chiefs needed offensive linemen and Fisher seems like the consensus best guy (even though two weeks ago the consensus best guy was Luke Joeckel). My only question is the level of competition he played against. Central Michigan isn't playing the same teams as Texas A&M, so is he as NFL "ready" as Joeckel? Time will tell. 7. Gruden is hating on Miami's pick of Dion Jordan. I have to say I agree. He's a "smaller" edge rusher with limited experience. That sounds like the next Aaron Maybin to me, although I'm sure the Dolphins are expecting the next Aldon Smith. 8. Lane Johnson just went to the Eagles. I'm yet to be interested in any player drafted. Hopefully the Lions pick someone who actually touches the football. 9. Nope. They go with Ziggy Ansah. Who is seemingly wearing 3-D glasses?! 10. My Bills shake it up by trading the 8th pick to the Rams for the 16th pick, and an extra 2nd rounder and 7th rounder. I love it! Not only does it give us a desperately needed extra pick, but it makes us relevant! The Bills have single handedly altered the course of this draft. We haven't been talked about this much on ESPN in forever. 11. Tavon Austin is picked by St. Louis. This sounds like a unanimous thumbs up from the Draft commentator community. I agree. A major reason why Geno Smith was projected as one of, if not the top quarterback, was the production he had from Tavon Austin. Austin should run wild on the St. Louis turf. Some might question his size, but smaller receivers are more and more productive every year in today's NFL. Sam Bradford is smiling. Rex Ryan is not. From all accounts, the Jets wanted to get younger and faster, and were very interested in Austin. Another shout out to my Bills: by trading with the Rams, it kept a touchdown-maker out of the hands of our division rival. Smooth move, Buddy Nix. 12. Congrats, Dee Milliner. You have to fill the shoes of one of the best players in the league in the biggest media market in the world. The Jets replaced a cornerback coming off a serious knee injury with a guy who's had five surgeries before his 22nd birthday. 13. D.J. Hayden just went to the Raiders. You could make the argument that the average football fan doesn't recognize the name of anyone selected thus far: Fisher, Joeckel, Jordan, Johnson, Ansah, Mingo, Cooper, Austin, Milliner, Warmack, Fluker, Hayden. 14. Once you sift through the BS, mock drafts and awkward dude on dude hugs, the Draft really is one of the best sporting events of the year. It's so enjoyable. For all the ways you can make fun of ESPN (Skip Bayless comes to mind), it's pretty amazing what they have built this into. 15. What a moment for the young man from St. Jude's Hospital. 17. Initial reaction: I like it. I like his size, running ability, accuracy. He's said to be a great leader and all-around good guy. He won any bowl game he ever played in and was MVP of the Senior Bowl (maybe the most important "game" of his college career). 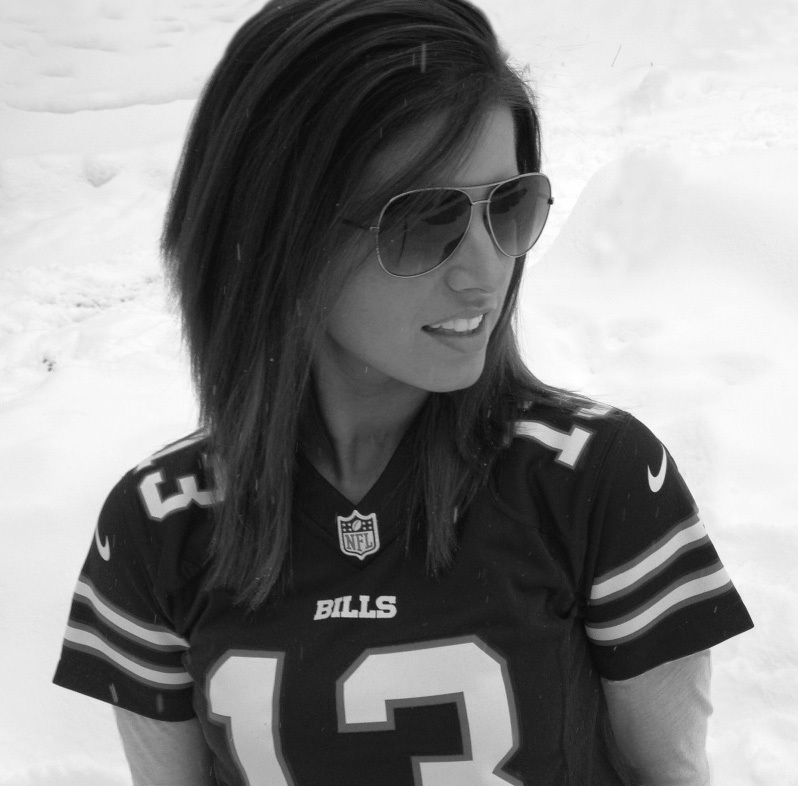 Go Bills! 18. I really like the Tyler Eifert pick by Cincy. It's another weapon for Dalton and will potentially take safety help away from A.J. Green. I'm predicting big things for the Bengals this year. 19. This booking.com commercial was sneaky hysterical. 20. DeAndre Hopkins was one of my favorite guys coming into the Draft. Great hands, good size, always seems to be open - even when he's covered. Nice scoop by the Texans to play alongside Andre Johnson and give more depth to their offense. 21. Holy picks! The Patriots just got four picks from the Vikings as Minnesota gets back into the 1st round. Should the Patriots even send representatives to Radio City on Day One? 22. I was about to praise Minnesota for their 1st round picks with Sharrif Floyd and Xavier Rhodes, then they went and dropped four picks to get the biggest boom or bust guy available. Cordarrelle Patterson could be great, but I'm always hesitant with "raw" receivers who have possible attitude problems. 23. Matt Elam is so not as interesting as Manti Te'o. On to Round 2! 1. Rudy (1993) -- If you don't get moved by Rudy, you don't have a soul. I don't care if the actual Rudy milked his story for every dime he could later in life, and I also don't care that Joe Montana (who played on Rudy's final Notre Dame team) said they carried him off the field as joke. It's still the best. 3. Lucas (1986) -- This is one of the most underrated movies of the '80's. Classic '80's actors: Corey Haim, Charlie Sheen, Winona Ryder, Kerri Green, Courtney Thorne-Smith, Jeremy Piven (with less hair then he has now). Classic '80's storyline: nerdy kid is bullied by jocks, but ends up showing everyone the true meaning of success. Classic '80's scene: every character in the movie gathers in the same hallway of their high school at the same time and breaks into a slow clap (scroll to the 13:00 minute mark of the video for this scene). Amazing. 4. Remember the Titans (2000) -- A great movie with a greater soundtrack. Worst Ever: The Blind Side (2009) -- I'm sure this will be an unpopular pick with you readers, but I don't care. This movie is more overrated than Rob Ryan. I don't understand how Sandra Bullock's performance was critically acclaimed, and I think the real Michael Oher could of done a better job than the actor who played him. 1A. Field of Dreams (1989) -- If and when I have a son, I'm going to make him watch Field of Dreams with his father. I will then proceed to weep uncontrollably as I watch them watch this final scene. 1B. Bull Durham (1988) -- This movie has everything: good baseball scenes, great lines, and a love triangle involving a gorgeous Kevin Costner. My favorite thing about the movie is that it centers around a minor league team, not a major league team. The struggle to get to "The Show" creates a relatable dynamic between the characters and the viewer. Perfect movie. 3. The Natural (1984) -- Filmed in Buffalo, NY (Go Bills!!! ), The Natural combines beautiful cinematography with great costumes and scenery from one of my favorite historical periods - the 1920's and 30's. 5. The Bad News Bears (1976) -- I almost called a three-way tie here with The Sandlot and A League of Their Own, but I give Buttermaker and company the edge. How could I not love a movie that features a girl showing the boys how it's done! Honorable Mention: The Sandlot (1993), A League of Their Own (1992), Eight Men Out (1988), Moneyball (2011), 42 (2013) - the trailer alone puts it on the list! Worst Ever: Air Bud, Seventh Inning Fetch (2002) -- This is not joke. It's an actual movie. Granted, I have never seen it, but the title itself earns it the spot. 1. Hoosiers (1986) -- This is my easiest number one pick of any five. Based on the real-life story of the Milan Indians, who improbably won the Indiana state basketball championship in 1954, Hoosiers is a flat out great sports story. Yes, it's about basketball, but really it's about teamwork, redemption, and the love of sport, and uses basketball as the vehicle to tell those stories. Plus, it has the coolest character name in any movie for any sport: Jimmy Chitwood. 2. White Men Can't Jump (1992) -- Everything you ever wanted to know about this movie is right here. 4. Above the Rim (1994) -- This is not a movie that automatically comes to mind when ranking sports films. It only comes up in conversation (19 years after it was released) when someone rehashes the life of Tupac Shakur. Nonetheless, I like it. Where White Men Can't Jump is a comedic look at the game from a west coast playground perspective, Above the Rim is a gritty look at east coast urban street ball. Plus, it has a great soundtrack for anyone who's into early '90's hip hop. 5. Teen Wolf (1985) -- I'm a child of the '80's (if you couldn't tell). Worst Ever: Juwanna Mann (2002) -- If you haven't seen this, consider yourself lucky - although I don't know how you haven't. It seems like one of TBS's go-to movies (which also includes Hitch, Failure to Launch and Wedding Crashers) and is always on when you're flipping channels on a lonely Saturday night. ** As a side note, basketball movies blew up in the '90's. From the dawn of cinema until 1991, I've counted 5 major motion pictures that used basketball as the main storyline. Since 1991, there have been 39! Not consequently, '91 was the year Michael Jordan won his first title. Jordan's influence on sport and culture is practically unquantifiable. 1. The Fighter (2010) -- It may seem like blasphemy to not have Rocky or Raging Bull in the top spot, seeing as how Rocky won Best Picture in 1976 and Raging Bull is 4th on AFI's list of 100 Years/100 Movies, but I'm a big fan of The Fighter. Christian Bale is unreal as Dicky Eklund, the crack-addict half-brother of professional boxer Mickey Ward, played by Marky Mark. His performance (for which he won an Oscar) is reason alone to have this #1, but besides the great acting, I love how they filmed the fight scenes as though you were watching the real thing. Check out this clip to see what I mean. 2. Rocky (1976) -- A must in this spot. 3. Raging Bull (1980) -- See above. 4. Million Dollar Baby (2004) -- This movie is crazy sad. Beautiful, poignant, tough, but sad. Which made me realize, there are no "comedy" boxing movies. Try to think of one. Seriously. You can't, can you? I guess it's hard to make jokes out of people punching each other, but ultimately it makes my boxing top 5 pretty intense. Worst Ever: Rocky V (1990) -- Stallone just didn't know when to call it quits. He's quoted as saying that he made the 5th Rocky installment (and the 6th years later) out of greed. Not entirely surprising, seeing as how the whole movie seems mailed in. Something you may not have known: the film was set to end with Rocky dying, but Stallone made a last minute decision to save him. Wrong call, Sly. 1. Dirty Dancing (1987) -- Yes, I'm being serious. Remember, it's Football CHIK, not Football DUDE. Many would consider dancing a sport and I'm no different (plus, it's one of my favorite movies so I needed to get it in here somehow). 2. Kingpin (1996) -- Hands down the funniest movie on the list. Where some comedies seem dated only a few years after they're released, Kingpin holds up 17 years later. Bill Murray is hysterical as Ernie McCracken, even though you despise him for the full 2 hours. Big props to the Farrelly Brothers, who consistently use sports or sports figures as a storyline or character in their movies (think Cam Neely, Roger Clemens and Brett Fav-ra). 3. The Karate Kid (1984) -- Love the tournament montage scene with Joe Esposito's, "You're the Best" playing in the background. Watch the clip and enjoy. 5. Tin Cup (1996) -- Kevin Costner makes the list again, but this time as a golfer. What I love about this movie, similar to The Fighter, is how the U.S. Open scenes are set to the backdrop of Jim Nantz giving true to life calls. It makes the whole experience of watching the movie that much more real. Honorable Mention: Win Win (2011), The Wrestler (2008), Breaking Away (1979), Days of Thunder (1990), Rad (1986), Caddyshack (1980) - What can I say? I'm not the biggest fan. It's definitely a funny movie with memorable lines, but it doesn't crack the top 5 for me. Dare I say it's overrated? Gasp! Worst Ever: Rollerball (2002) -- There are definitely a lot of contenders for this spot - Blades of Glory comes to mind almost immediately - but in the end, Rollerball wins out. Roger Ebert described it as, "an incoherent mess, a jumble of footage in search of a plot, meaning, rhythm and sense." CinemaBlend.com said, "it's truly rare that [a] film can so completely and wholeheartedly deliver absolutely nothing on every possible level," and called the star of the movie, Chris Klein, "painfully talentless." But my favorite quote comes William Harrison, the author of the original Rollerball book the movie is based on: "I've never watched the 2002 incarnation of Rollerball, and have no interest in it." Enough said.